The Japanese government calls efficient coal fired power plants “clean coal”, because pollutants (NOx, SOx, etc.) that causes asthma and other health issues have been reduced by about 90% compared to before and CO2 emissions have been reduced. 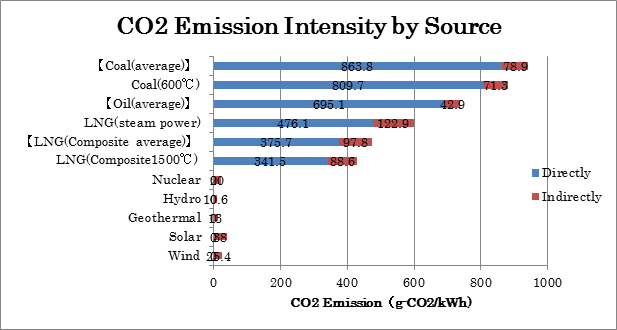 However, even with the newest and most advanced coal fired power plants (in the figure below, “advanced” power plants use USC (600°C class)), coal is the biggest source of CO2 emissions; it emits more than twice as much CO2 than natural gas (see figure below). With technologically advanced IGCC technology (mentioned in section 4), emissions will only be reduced to levels equal to that of oil which suggests that coal will unquestionably emit large amounts of CO2. A facility that emits so much CO2 is hardly “clean”. A single coal fired power plant emits approximately 10-20 Mt-CO2, which is roughly what 1-2 million people emit in a year. The construction of one power plant can completely undermine the energy-saving efforts of individuals. As mentioned above, CCS is a technology that reduces atmospheric CO2. This process, however, still has major unsolved risks, such as the lack of land for storage in Japan, the large amount of energy needed during the storage process, and possible leakage of CO2 and the impact it can have on the environment. Also, the technology is not developed to the point where it can be utilized for power plants currently being built. Note: Coal (600° class) refers to USC (Ultra Super Critical), LNG (Composite 1500°C) refers to 1500°C class combined cycle power generation (MACC), which were the latest technologies based on data from 2009. *Indirect: emissions that result from construction, transportation of fuel, etc. Currently, the main reason given for using coal is that it is cheap. However, there is no guarantee that it will stay cheap. Considering the price of coal, there is a trend towards a rapid increase beyond the expectations of research institutions. Although an accurate prediction is difficult, the price is projected to rise further with increased demand from China and India. The construction cost of coal fired power plants will also increase if the latest technologies such as CCS and IGCC are adopted. Additionally, facilities that emit high levels of CO2 will have to implement costly measures to reduce CO2 emissions in the future, because there is a clear, global call for reducing CO2 emissions that power plants will be forced to observe. The excuse that coal is cheap does not hold anymore, for the future costs of coal may be high and unstable. Since the Fukushima Daiichi nuclear accident in March of 2011, all nuclear power plants in Japan have been suspended; however, Japan survived both the summer heat and winter chill the following year without any blackouts. TEPCO has acquired emergency power ever since the nuclear accident and it plans an increase of 6600MW by 2017. Within this expansion plan, TEPCO included two coal fired power plants (Hirono Unit-6 600MW and Hitaichinaka Unit-2 1000 MW) that were activated in 2013. There is already enough power plants to generate electricity in Japan. There is no need to build new coal fired power plants alongside the efforts to increase renewable energy.